Connie Willis' Hugo and Nebula Award-winning Doomsday Book uses time travel for a serious look at how people connect with each other. In this Hugo-winning companion to that novel, she offers a completely different kind of time travel adventure: a delightful romantic comedy that pays hilarious homage to Jerome K. Jerome's Three Men in a Boat. When too many jumps back to 1940 leave 21st century Oxford history student Ned Henry exhausted, a relaxing trip to Victorian England seems the perfect solution. But complexities like recalcitrant rowboats, missing cats, and love at first sight make Ned's holiday anything but restful. To say nothing of the way hideous pieces of Victorian art can jeopardize the entire course of history. 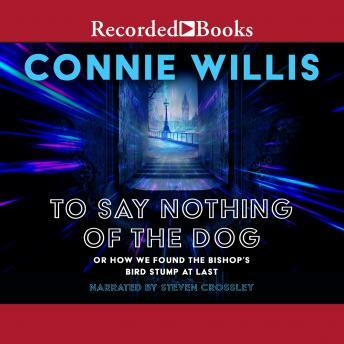 Delightfully aided by the perfect comedic timing of narrator Steven Crossley, To Say Nothing of the Dog shows once again why Connie Willis is one of the most unquestionably talented writers working today. A most relaxing book to listen to. A well told story well read. Truly enjoyable and full of wit, this was a delight. The book itself is wonderful and the narrator brings it to life expertly.